In the beginning...the start of it all. Deceit. Betrayal. The fall. 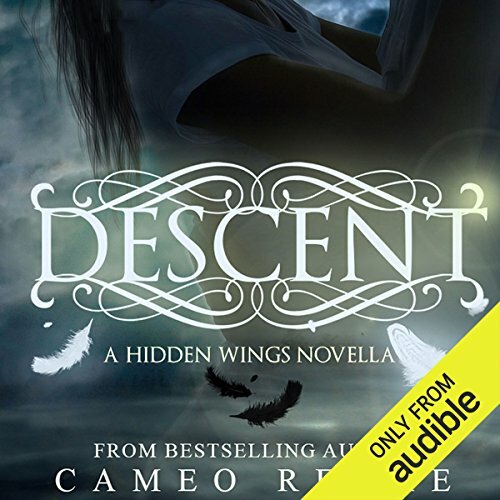 ©2013 Cameo Renae (P)2015 Audible Inc.
What made the experience of listening to Descent the most enjoyable? It felt like you were right there experiencing it all. Alanie from being found out. Absolutely! you will hang on every word! The story of Samuel and Aliane is beautiful and heart breaking. Yet at the same time It also gives you the background of things you were wondering about in book one. it was strange how it jumped from a narrative type to first person. good story. Cliché. Sucked. Didn't finish. Returned. The narrator was FAR too old to voice a 17 yo girl and didn't bother to differentiate between character voices enough to matter. Save your credit! Not as good as the rest of the series. not much new information, different character name pronunciations by different narrators. You don't miss anything skipping this one, unfortunately. I loved this this book very much and am excited to read each one in the series! Great beginning to the Hidden Wings series! Where does Descent rank among all the audiobooks you’ve listened to so far? What other book might you compare Descent to and why? I adore the Sweet Evil series by Wendy Higgins, and I feel that this story has a lot of similar ideas, including angels and demons, a forbidden love story and a lot of action. I enjoyed how the narrators read with emotion. One of the women occasionally used inflection when it didn't seem 100% appropriate (From time to time, she sounded excited when nothing exciting was happening.) and her pronunciation of "nephilim" was different than I have ever heard, but the man said it the way I am used to. I thought that should be consistent throughout. But otherwise, I thought they did a great job of giving the story feeling. The struggle of Good vs. Evil is real, and it's a battle that's going on right under our noses! Amazon has this story listed as 1.5 in the series, but I really think this would be a great start to the series (or .5) since it happens first chronologically. Many kudos to Cameo Renae and all the performers in this audiobook. The story is beautiful and filled in all the background details of the main characters. The narrators did a terrific job bringing it to life. I highly recommend it as well as the remainder of the series. I felt like it was written by a love sick 15 year old. Narrator didn't help either. Maybe if I had listened to book one first it would have been better? But I felt like having the background story would have been best before I listen to book one.